The esophagus is a muscular tube that connects your mouth and your stomach. Rings of muscle (sphincters) in the upper and lower portions contract and relax to allow food and liquid to pass. See your doctor if you regularly have difficulty swallowing or if weight loss, regurgitation or vomiting accompanies your dysphagia. If an obstruction interferes with breathing, call for emergency help immediately. If you're unable to swallow because you feel that the food is stuck in your throat or chest, go to the nearest emergency department. Swallowing is complex, and a number of conditions can interfere with this process. Sometimes the cause of dysphagia can't be identified. However, dysphagia generally falls into one of the following categories. Achalasia. When your lower esophageal muscle (sphincter) doesn't relax properly to let food enter your stomach, it may cause you to bring food back up into your throat. Muscles in the wall of your esophagus may be weak as well, a condition that tends to worsen over time. Diffuse spasm. This condition produces multiple high-pressure, poorly coordinated contractions of your esophagus, usually after you swallow. Diffuse spasm affects the involuntary muscles in the walls of your lower esophagus. Esophageal stricture. A narrowed esophagus (stricture) can trap large pieces of food. 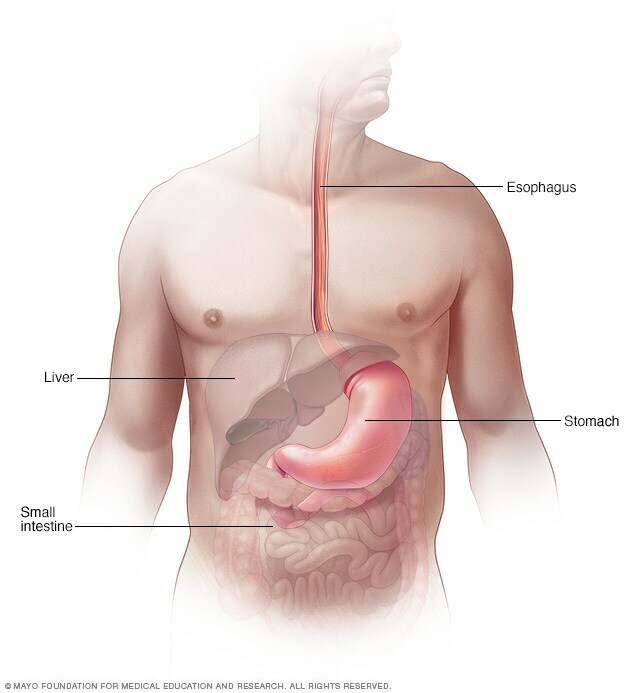 Tumors or scar tissue, often caused by gastroesophageal reflux disease (GERD), can cause narrowing. Foreign bodies. Sometimes food or another object can partially block your throat or esophagus. Older adults with dentures and people who have difficulty chewing their food may be more likely to have a piece of food become lodged in the throat or esophagus. Esophageal ring. A thin area of narrowing in the lower esophagus can intermittently cause difficulty swallowing solid foods. GERD. Damage to esophageal tissues from stomach acid backing up into your esophagus can lead to spasm or scarring and narrowing of your lower esophagus. Eosinophilic esophagitis. This condition, which may be related to a food allergy, is caused by an overpopulation of cells called eosinophils in the esophagus. Scleroderma. Development of scar-like tissue, causing stiffening and hardening of tissues, can weaken your lower esophageal sphincter, allowing acid to back up into your esophagus and cause frequent heartburn. Certain conditions can weaken your throat muscles, making it difficult to move food from your mouth into your throat and esophagus when you start to swallow. You may choke, gag or cough when you try to swallow or have the sensation of food or fluids going down your windpipe (trachea) or up your nose. This may lead to pneumonia. Neurological disorders. Certain disorders — such as multiple sclerosis, muscular dystrophy and Parkinson's disease — can cause dysphagia. Neurological damage. Sudden neurological damage, such as from a stroke or brain or spinal cord injury, can affect your ability to swallow. Pharyngoesophageal diverticulum (Zenker's diverticulum). A small pouch that forms and collects food particles in your throat, often just above your esophagus, leads to difficulty swallowing, gurgling sounds, bad breath, and repeated throat clearing or coughing. Aging. Due to natural aging and normal wear and tear on the esophagus and a greater risk of certain conditions, such as stroke or Parkinson's disease, older adults are at higher risk of swallowing difficulties. But, dysphagia isn't considered a normal sign of aging. Although swallowing difficulties can't be prevented, you can reduce your risk of occasional difficulty swallowing by eating slowly and chewing your food well. Early detection and effective treatment of GERD can lower your risk of developing dysphagia associated with an esophageal stricture.